Today we spent time with the Shining Star kids. Shining Star is a program at our church where families buy gifts for those less fortunate and the church throws a big party with crafts, Santa, face painting, and all. For me the best part of the day was when Ryley led me down the aisle and found Pet Patrol. She was so excited to buy the gift for the little boy it made my heart explode. 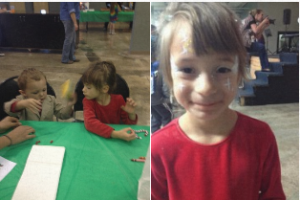 Then to see her helping other kids with artwork and crafts was a mother’s dream. Not sure if giving is all soaking in yet, but Ryley had fun and this put a smile on my face. Plus, it was good to know we had put smiles on lots of other kid’s faces. A great day of living the true meaning behind this season!